UPDATED 2/28/2015 -- I was contacted by Garfield's sister and it was a moving conversation. See the addendum at the bottom of the page for details. No, this is not about photography; but it is about art, about creativity, about opportunity... and about failure. I'm going to tell you a little “Greek Tragedy” of a story about heroes, hope, and sad endings. Still, this story came to me as a result of photography. 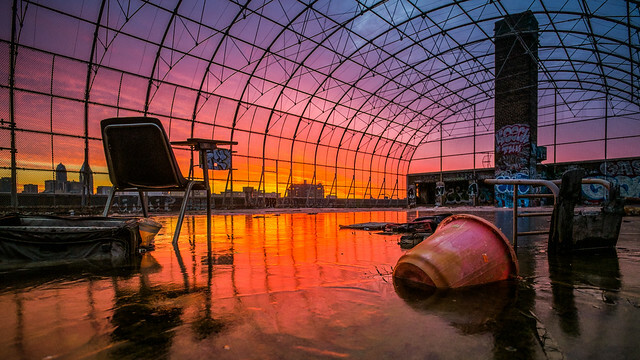 I published a set of pictures from an urbex run in north Philadelphia, Pennsylvania that I titled “Disappointment” which referred to the fact that the photographic subject we had intended to shoot (an abandoned power plant) was sealed up and unreachable. 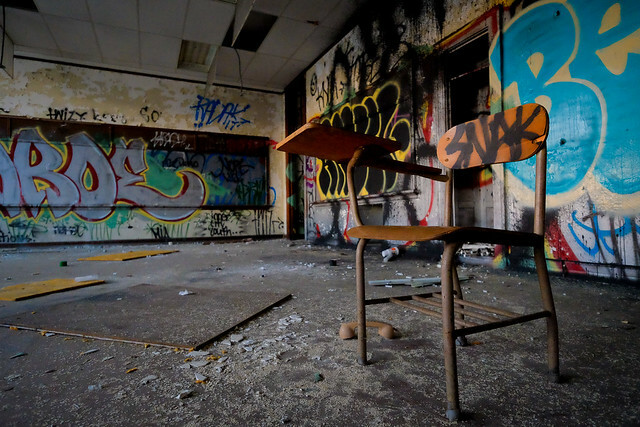 Our fallback was the abandoned old site of the Spring Garden Elementary School. 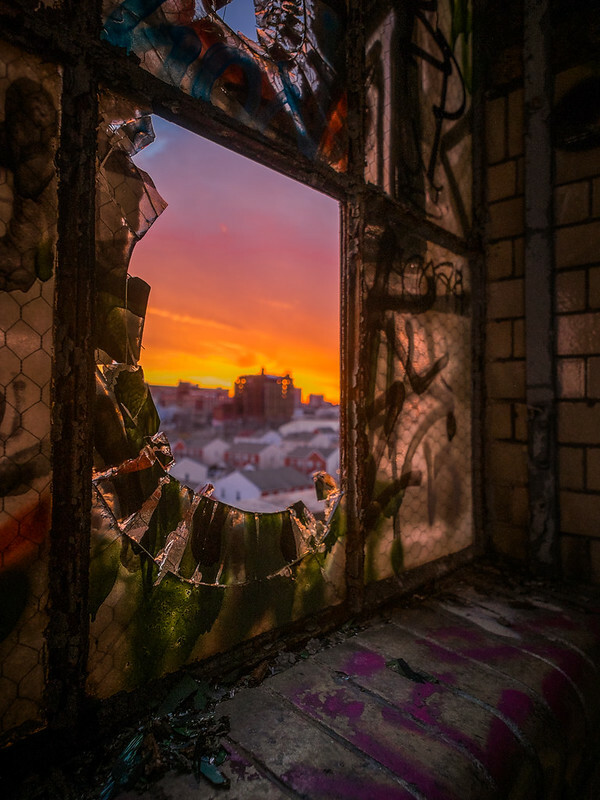 From the roof of this building, shooting into a glorious sunset, I took a shot which contained the also derelict “Divine Lorraine” hotel – which is the shot I opened the blog with. Shortly thereafter a former reporter that worked in Philadelphia in the late 1960's contacted me. He follows my work, saw my photos and the title “Disappointment”, and told me an amazing and tragic story of disappointment he experienced. His account led me to dig up a couple of more sources on the story and it's just too poignant not to share. It's a story that played out scant blocks from the old Spring Garden Elementary where we were shooting. I have no photos from that era to which I have rights so the photos here are just decorative, taken in the cities of Chester and Philadelphia. There are four photos that are courtesy of Garfield Peacock's sister, Rosena Adderly Blackwell. 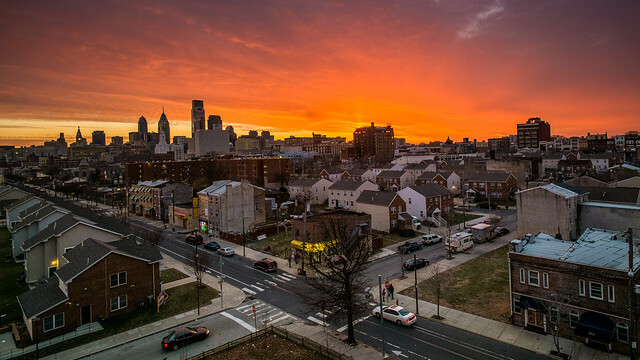 Parts of north Philadelphia in the 1960's were described to me as being “like Beirut in the 1970's” – that is to say, when Beirut was blasted by long running civil warfare. Buildings were falling in on themselves. Cars in various states of abandonment, burned and stripped in many cases, were to be found along many streets in the blighted neighborhoods. Although there are still parts of the city like that, Philadelphia is not the city it was then. Opportunity was a catch phrase, and not something real to the poorer city residents – many of whom were black. Life could be bleak. As that opening quote from Jimi Hendrix implies, in any environment like this the “gang” will form for mutual advancement and self protection. The rules may vary, and the details may be different – but the general idea is the same. It's a matter of “us” and “them” and heaven help “them”. In a subsistence environment, tactics for survival can be brutal. In the 1960's, Harold Haskins attempted to improve “urban ecologies” and in particular by doing work with gangs. 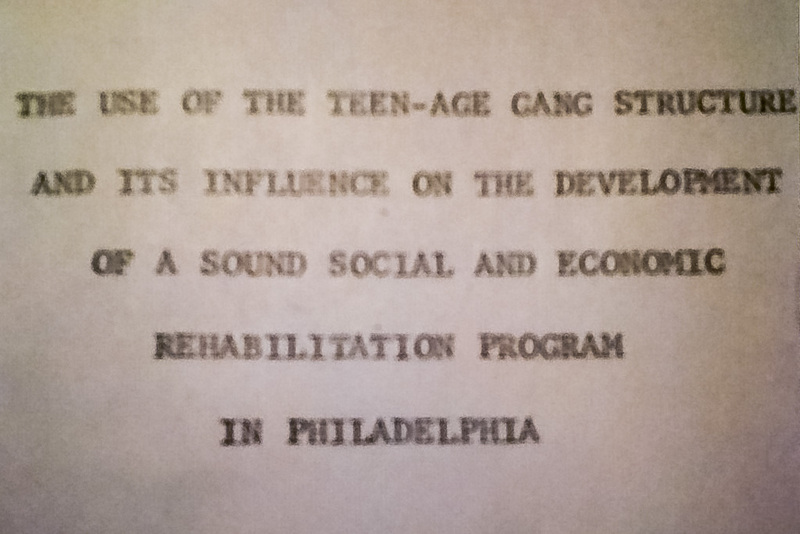 One of the gangs he worked with was “12th and Oxford” – a street gang in northern Philly. Haskins later became a driving force in convincing gangs to disband and get an education. His work ultimately led him to positions at the University of Pennyslvania where he was an untiring advocate for student development for 33 years before finally retiring in 2013. Haskins at the time worked as an associate for community planning at Temple University. 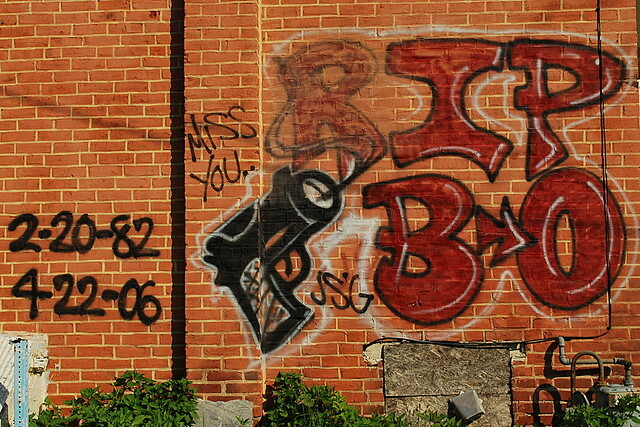 Among many schemes to improve urban conditions, he conceived a project to have gang members make a documentary about their lives. One of these documentaries is an award winning 20 minute short film called “The Jungle” which I'll link later. The entire project was written and filmed by the gang members themselves. “In the 1960s, the ultimate in film documentary production was exemplified by the work of Frederick Wiseman and the Maysles brothers, Albert and David. It was the era of fly-on-the-wall observation of people in real situations; cameramen would spend extraordinary periods of time with their subjects in day-to-day life. The goal was to become so familiar as part of the surroundings that they would go unnoticed by the people being filmed. To a surprising degree, they succeeded. This was much more difficult to pull off at that time. There were no camcorders, no portable video gear. The smallest handheld 16mm camera was the Bell & Howell DR-70, a former military issue item with three prime lenses mounted on a turret. It could be held in one hand and was heavy enough and sturdy enough to be used to bash someone's head in if necessary. 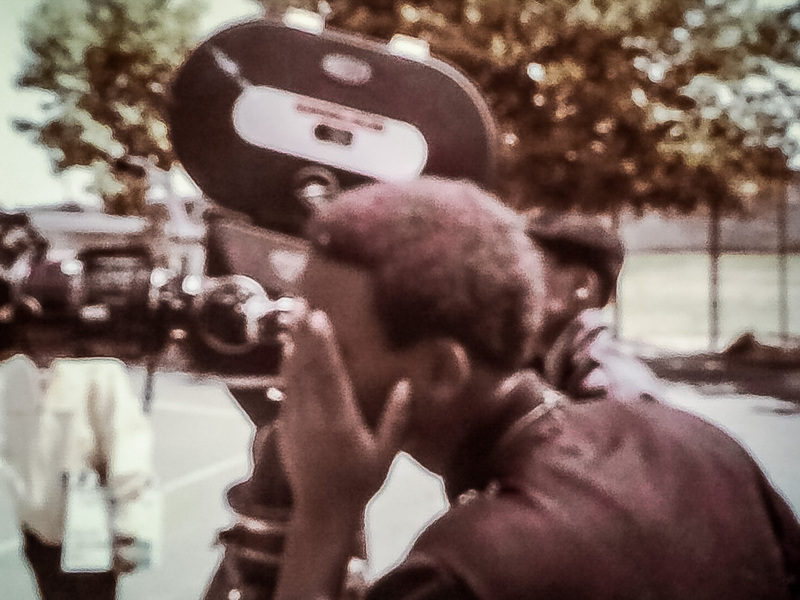 Sound-on-film cameras were much larger. The documentary guys often used delicate Eclair 16mm cameras coupled with a separate Nagra reel-to-reel tape recorder operated by a sound man. 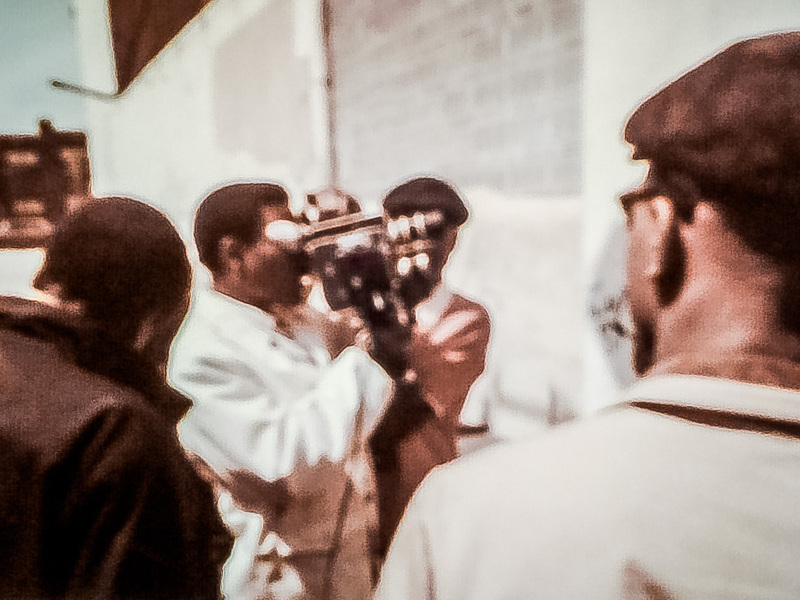 TV news crews used Auricon single-system 16mm cameras equipped with 400-foot film magazines. The film had a stripe of magnetic audio tape along one edge to record a soundtrack. This rig was carried on a shoulder mount. The camera body weighed in at 24 pounds plus 400 feet of film, plus the shoulder mount, plus the weight of a 12-120mm Angenieux zoom lens. It's worth keeping in mind that this gear was not only heavy – it was quite expensive as well. In our media saturated age where every geek with a smartphone can make a movie we forget that it used to be a very big deal indeed to produce moving pictures with sound. Haskins managed to get the attention of the local media and had already pulled off a unique film project. He conceived having gang members make an authentic film about their lives as a vehicle for showing them what was possible for them. He seemed to be showing them how to leverage what they already knew about cooperation and overcoming difficulties. Later they actually formed a corporation with their earnings from the film, buying property and operating a neighborhood laundromat. In the 12th and Oxford gang, one member stood out handling the awkward camera equipment, showing both a conscious and instinctive affinity for the light and framing. His name was Garfield Peacock. He became the main cameraman for the group and as they later decided to make more films he was pegged as their leader for camera work. I think this is a great time to introduce you to the film that resulted, “The Jungle”. One thing I ask as you watch it, watch it with eyes that look for the brilliance in the camera work and story telling, not the crudeness of the 16mm film production under uncontrolled lighting conditions. In fact, as a devotee of photography by available light, I'd say Peacock's use of backlighting to outline forms in an environments where it was really too dark to shoot in is wonderful. It's crude by today's standards, but still quite amazing. The violence was staged, and not too badly. No one was killed in the making of the film. We've talked about the terrible times then, about hope, and we have had a hero in the person of Harold Haskins. Now, sadly, we come to the awful part of our tragic tale. And such a sad ending it is: gang members, raised in consciousness, turned into legitimate businessmen embraced by the city council – it seems such a wonderful outcome and in many ways it was. Peacock was described to me as someone who was a cut above – a gang member who actually embraced his education even in the midst of the gang violence. He was a young man with an awareness even prior to Haskin's arrival. He managed to finish high school which was no mean feat in the midst of everything going on around him. His qualities attracted the attention of people in the media and academic communities who even found a full scholarship for him at the Indiana University of Pennsylvania – a free ride as long as he could keep his grades up. He was to start in the fall of 1969. Things were looking up. But in the summer of 1969 he was murdered by a rival gang member with a sawed-off shotgun. The myth is that he was shot simply for walking on the wrong side of the street and there is a little truth in that, but not the whole truth. 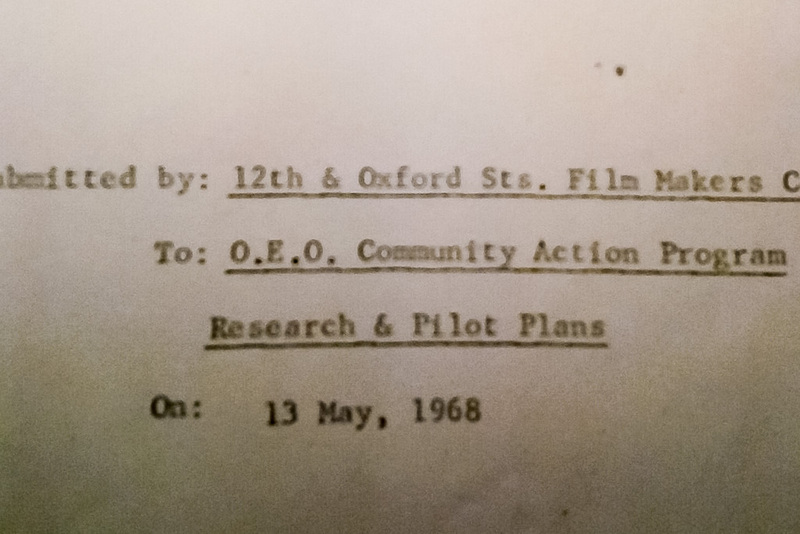 Some accounts maintain it was jealousy: the others in the community who had not been favored like the 12th and Oxford gang were itching to take the 12th and Oxford folks down a peg. That's likely true on a certain level, but an alternate telling of the end of Garfield Peacock exists. Desperate for help, Garfield finally put in a call to WCAU cameraman Phil Galligan to help him. But it may have been his undoing as pay phones those days were in plain view in very public places. Peacock was apparently seen and pursued. The story is that Galligan scoured the area to find him... but failed and Peacock was found and shot by the rival gang. And so ends the story of Garfield Peacock... or perhaps not. There is no telling who he personally, and through his story and example, might have inspired or instructed. I'm sure there are many stories of people who shined brightly, but briefly, and some we may never hear of. But I was moved by this story and wanted to bring it to you in the hopes of a little bit of “earthly immortality” for the memory of Garfield Peacock. Remember him, and maybe tell his story to others. "My name is Rosena Adderly Blackwell. Yesterday I was telling my daughter about my brother whom I do not remember. I have heard stories from my mother, bits and pieces but could sense she still was hurt. I went on the internet and entered, who was Garfield Peacock, and there it was, all questions answered 45 years later. I would like to thank you for writing a wonderful documentary and not letting his memory just vanish. Thank you for answering questions that I thought at this point, I would never find answers to. Much appreciated. I'm just happy that my parents can rest in peace knowing after so many years, he is not forgotten. Several days before my mother passed, she saw Garfield but there was no one else in the room just us two. Garfield had 2 sisters: myself and Marlene, who was actually old enough to remember the murder. Also two brothers Gary and Thomas. You can add to the article what you choose. I thank everyone who has taken part of this bringing life to his death.